The offspring of a giant oak that died at 619-years-old appears in good health. The historic grounds of Basking Ridge Presbyterian Church offer a reminder of what Arbor Day, celebrated on Friday, is all about. 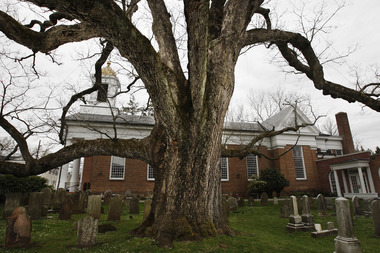 On one side of the 18th Century church is an enormous, mostly flattened tree stump where a 619-year-old giant white oak, believed to be the oldest tree in the United States, towered until being cut down a year ago. The tree was removed because it was dying and posed a safety hazard, but its decline led to a rebirth. Two weeks before it was cut down, workers trucked in a much smaller, and younger, tree, ordinary in every way except in its lineage. In 2001, when it became apparent that the giant oak’s days were numbered, Union County College biology professor Tom Ombrello planted seedlings from the tree in the college’s tree grove. Ombrello said visitors should not be alarmed that the tree, which stands about 20 feet, hasn’t really grown in the past year. “When you move a tree, especially a tree of some size, there’s very little growth the first year. You’re happy if it just holds its own,” Ombrello said. Perhaps in another six centuries, it will reach the remarkable height of its predecessor, which was planted 300 years before the historic church was built in 1717. It soared about 100 feet in the sky. Jon Klippel, who moved to Basking Ridge in 1967, is among those keeping an eye on the young oak. “It was such a tremendously heartwarming gesture and action, to be able to have an offspring of the tree continue on the church property,” Klippel said. It cannot be overstated just how hard, and for how long, community members sought to preserve the giant oak under which George Washington, it is said, once picnicked. Workers over the years poured three tons of concrete into a cavity inside the tree, and an extensive network of steel rods and steel cables were installed to help support sagging branches. Ombrello, walking a visitor through the church grounds recently, pointed out a pole that remains, though the branches it help support are gone. “They cabled the tree. They did everything you could to keep this tree healthy — but, you know, at some point, nothing lives forever,” Ombrello said. Ironically, the giant oak’s removal led to more being learned about it. Previously, its age was estimated at 600 years, but no one was certain. Then the wood was sent to a furniture maker in Hillside. “When he was cutting up the wood, he found the section that didn’t have decay in the center — so then you could count the rings, from the outside in, and you get the exact age,” Ombrello said. “They have the exact age of the tree. It lived 619 years,” Ombrello said. That’s about three times as long as a typical oak might be expected to last. Though gone, it is far from forgotten. Klippel noted all the attention that the flattened stump draws. “If you were to watch the graveyard through a series of days, you would see people coming and going, and pausing to take a look at it. It still remains a point of interest,” Klippel said. That stump, though, is a sign of the past. The young oak is the future, and that’s at the heart of Arbor Day, which celebrates the planting of trees. There are no guarantees about the young oak and whether it might rival, or even surpass, the lifespan of its storied predecessor. While two or three centuries is the usual maximum expectancy for an oak to last, others fade more quickly. Ombrello was checking over the tree on April 18, for the first time since November, and said it appears healthy. “One way you get an indication of how a tree is doing is, just with your fingernail, you scratch the bark a little. It should look nice and green underneath, and that’s what we have right here,” Ombrello said as he scratched a narrow branch. “Everything looks good,” he added, while acknowledging that it is way too early to forecast the tree’s longevity. “I’m just hopeful, wishful, that this tree does well, because — you know, I plant a lot of trees, and if I plant a white oak, and the white oak dies, there’s always another white oak that can replace it,” he said. “But this tree has a history. This is kind of one of a kind. So, you just hope Murphy’s Law doesn’t come into play here, where the one tree that you want to do best doesn’t do so, but I don’t have that feeling right now,” he said.